Anyone interested in someday owning a Cane Corso. Anyone with a Cane Corso over 18 months of age wondering why it’s out of control. Anyone with a Cane Corso under 18 months of age wishing to avoid ‘out of control’ later in life. Cane Corso breeders (as a resource for puppy inquiries and buyers). Cane Corso specific rescues wishing to provide guidance to homes they send their dogs, also further contributing to ensuring the Cane Corsos they re-home do well in life. Veterinarians with Cane Corso puppy owning clients wishing to provide additional best paw forward guidance. Note: If you are someone with an already out of control Cane Corso and you’re worried that you won’t be able to turn things around, keep your dog or worse may have to euthanize, I am working on a different Cane Corso book for you that will be completed soon. (Faster if enough people indicate an interest.) The working title, ‘How To Turn Around A Cane Corso That Is Out of Control Without Treats Or Brutality’ – The Other Missing Manual’. Send me an email if you want to know when it’s finished or you want me to work faster. 🙂 Another option is a Skype consult. I’m certain that after reading ‘The Five Most Common Cane Corso Mistakes – How To Avoid Them And End Up With Your Dream Dog’ ($4.99 CND (About $3.75 U.S.) two things will happen. Some breeds of dogs are mini-vans and others are Ferraris. The Cane Corso is no mini-van. The males are sometimes slightly more intense, but male or female, the breed should almost be considered more a hobby than a pet. In the right hands, they are fantastic dogs. In the wrong hands, they can become much more so like guns with brains. That said, most of the myths regarding the Cane Corso are just that, myths. They aren’t ‘stubborn’. They don’t take years before they “settle down”. They don’t “only listen to men”. They can come when called, stay and heel – No Matter What. You don’t need treats (or ‘Might Is Right’) to train them, etc. How careful their breeders have been with the genetics they are working with before they selected a breeding pair as well as how they handled the puppies up until they were sold. Whether they find themselves in a mini-van vs a Ferrari capable home. 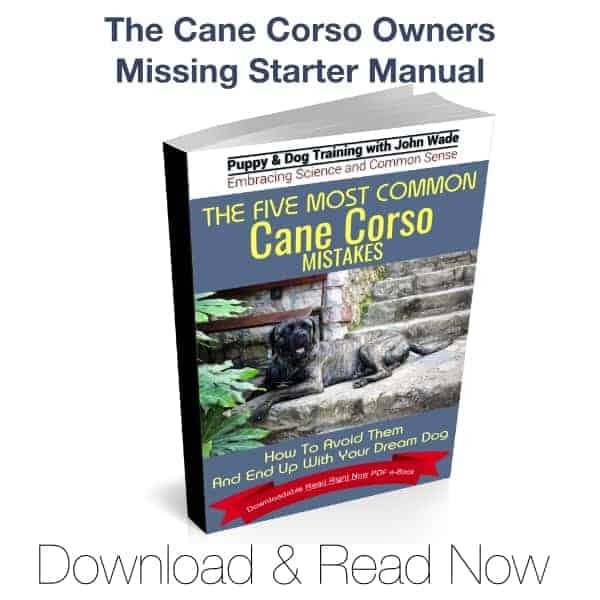 ‘The Five Most Common Cane Corso Mistakes – How To Avoid Them And End Up With Your Dream Dog’ ($4.99 CND (About $3.75 U.S.) is intended to provide some direction so you can provide that direction for your Cane Corso and so your Cane Corso can grow up to fulfill his or her potential, be a fantastic canine companion and always be an excellent ambassador for the Cane Corso breed. Dogs are exposed to one of the many fraudulent puppy socialization classes as opposed to implementing a legitimate socialization strategy during the dog’s critical imprinting period. It’s called critical for a reason. Their significant puppy cuteness (baby schema) distracts some puppy owners from developing a useful (and necessary) teacher/student or parent/child relationship. In many cases, this leads the dog into believing the relationship they have with their owner is more as roommates or them as the ‘golden grandchild’ making if far more difficult to guide them without bribery (or threats) when it becomes necessary and it will become necessary. The good news is you don’t have to love your dog less, but they do need to know and be reminded from time to time as to who is living in whose home. Training ideologies such as ‘Might Is Right’ but more commonly the highly flawed ‘All Positive/Purely Positive/Force-Free’ are used as opposed to legitimate behavior modification science. The first is fear/intimidation based, the second is dependent on addicting a dog to treats. Train by aiming at the tummy of the only species bred to love humans and you’re missing the best part of having a dog. There is a failure to consider and plan for what and when the dog is exposed to known negative behavior influencers between puppyhood and adulthood when the owner is unavailable to formally guide the dog. In the information-packed ‘The Five Most Common Cane Corso Mistakes – How To Avoid Them And End Up With Your Dream Dog’ ($4.99 CND (About $3.75 U.S.) you will learn to protect your Cane Corso from these common early relationship and training pitfalls that often result in the loss of the inclusive lifestyle most people envision and hope for when they decide to include a dog in their lives.